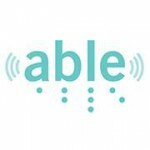 Urban Milwaukee » » Audio and Braille Literacy Enhancement, Inc. Audio and Braille Literacy Enhancement, Inc. Contact Audio and Braille Literacy Enhancement, Inc. Unique interactive braille activity sponsored by Wisconsin Talking Book and Braille Library (WTBBL), Audio & Braille Literacy Enhancement (ABLE), Vision Forward Association, the Milwaukee Public Museum and local school districts.